What is currently required to be reported to OSHA? 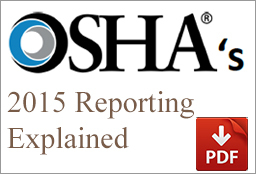 Starting 1-1-2015, what will employees have to report to OSHA? How soon must these be reported? Fatality: within 8 hours of finding out about it or if the death occurs within 30 days of a work-related incident. How do I report one of these events to OSHA? Occurred more than 30 days after the work-related incident if a fatality or more than 24 hours after the work related incident in the case of an inpatient hospitalization, amputation, or loss of an eye. NOTE: In the same ruling, OSHA has also changed the list of occupations that are now required to complete the OSHA 300 log. It is important to note that employees who had fewer than 10 employees in a calendar year are still exempt from having to complete an OSHA 300 log. For the new list of industries now required to complete a 300 log as well as additional information can be found at: www.osha.gov/recordkeeping2014. Have additional questions? Contact your knowledgebroker.